This is a blog about Phimai (พิมาย), a small town and district in the north east of Thailand. 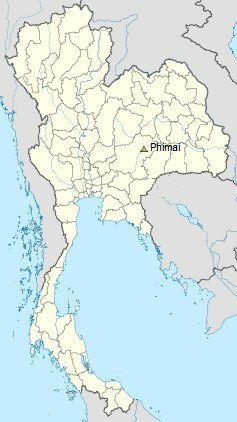 Thanks for good English Phimai information. I got an English local tour guide certificate so I need a lot of English information to interest tourists in Korat. Thanks for your comment, Pookie. I’m glad you like it. Thank you for putting so much effort into sharing all this info about Phimai in English with the world! Looking forward to visit during the festival this coming November, hoping to find out the actual dates soon. Thanks maew. The Phimai festival in 2013 will take place from 7th to 10th November. I am researching some transportation info for a temple in Korat, I understand it is not in Phimai, but could you suggest me anything? I will visit Phimai from Korat, while based in Korat, I will visit a temple called, Wat Ban Rai, which has a new elephant structure opened last year. How can I get there? and the cost? BTW, my next stop will be Chiang Khan, do you know the bus schedule from Korat? Awesome source of information! Thanks for putting this together. From Sam Rit Residency.